After the tragic death of racing legend Dale Earnhardt in 2001, NASCAR and industry partners have been inventing their way to safer tracks. NASCAR racing legend Dale Earnhardt was on turn three of the final lap of the 2001 season-opening Daytona 500 when Sterling Marlin’s car came in contact with Earnhardt’s rear bumper. Earnhardt temporarily veered to the left of the track before turning sharply back to the right—directly into the path of Ken Schrader. Fans gasped as Schrader’s car hit Earnhardt’s passenger door, slamming Earnhardt into the race track wall at an estimated speed of 155mph. The racing legend died on impact. The loss of such a prominent figure in NASCAR prompted several NASCAR safety improvements. Only a year after Earnhardt’s fatal crash, the newly invented SAFER barrier debuted at the Indianapolis 500. Development of a safer race track barrier began in 1999 at the Midwest Roadside Safety Facility (MRSF), originally part of the University of Nebraska- Lincoln. In 1990 they collaborated with several states to pool funding for roadside safety research and in 1999 a team of engineers led by Dr. Dean Sicking was contracted by the Indy Racing League (IRL), and in subsequent years by NASCAR, to invent a safer barrier. Researchers spent five years studying the physics behind car accidents, building and running computer simulation tests, and holding 26 full-scale crash tests. MRSF analyzed how kinetic energy is transferred, the influence of crash duration, track geometries and the potential trajectories of errant vehicles, and how angles and speeds can impact g-forces. They then began looking at materials. Concreate walls are too hard and cause too immediate of a stop, forcing the driver and car to bear the majority of the impact. Springy walls can bounce cars back into the race track where they can cause additional crashes. The MRSF’s final invention was a hollow steel tubing exterior with foam pyramids between the tubing and wall that spread and absorb the energy of the impact (here's a video illustrating the barrier: http://www.racingmadesafer.com/#/how-it-works). They named their invention the Steel and Foam Energy Reducing (SAFER) Barrier. 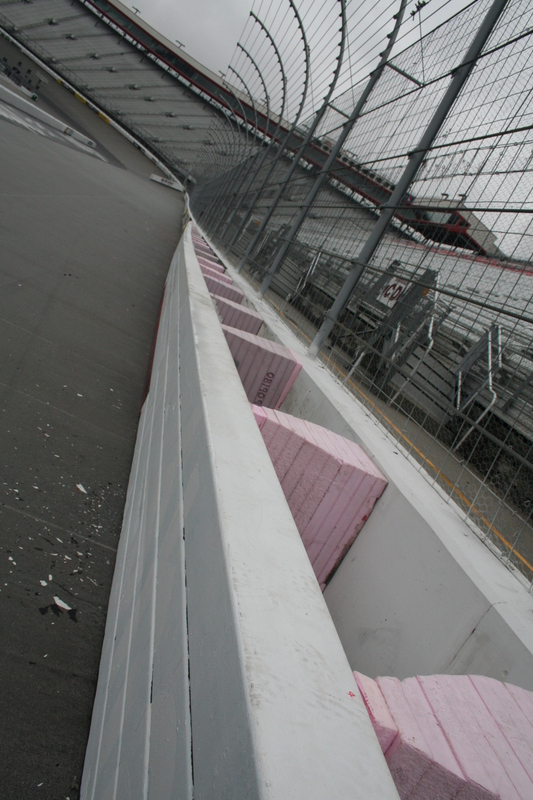 Instillation of the SAFER barrier at the Bristol Motor Speedway and Dragway in 2010. Since its 2002 debut the barrier has undergone further improvement and proven highly effective. 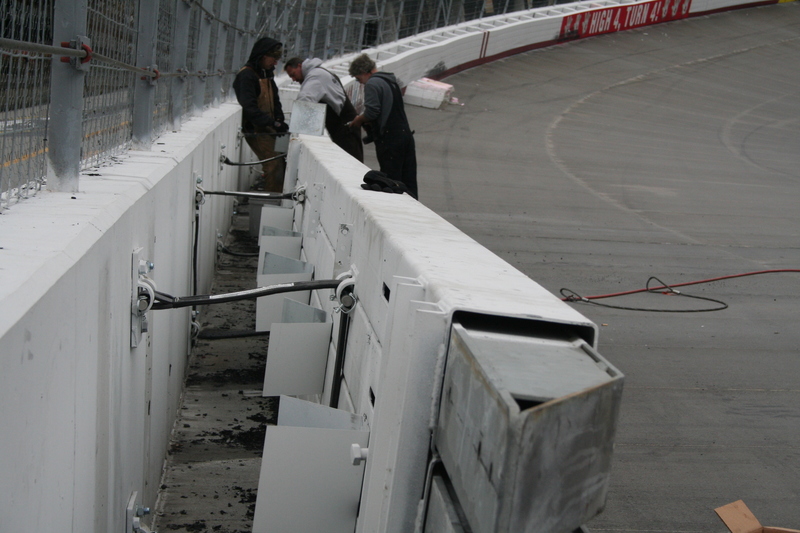 In 2003 NASCAR’s president boldly announced that every NASCAR track would have SAFER barriers; however, due to a lack of resources to produce the barriers, MRSF and NASCAR were restricted to installing the barriers at only strategic points along each track after reviewing the accident history of each track and installing barriers at key impact zones. Each barrier costs about $500 per foot and takes two to three months to retrofit from ordering the materials, perfectly fitting the steel tubing to the existing barrier, and a two to three week instillation. There is now debate about the merits of installing the barrier on all portions of the tracks. Although they make up only about 25% of all the safety features that protect drivers, SAFER barriers are recognized by the racing industry as one of the most significant car racing inventions. Lemelson Fellow Less Vinsel shares his research on the role that medical doctors played in improving auto safety.